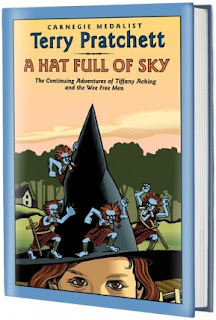 The second in the Tiffany Aching adventure, following The Wee Free Men, A Hat Full of Sky showcases this plucky young 11-year-old heroine's mettle as she embarks on her apprenticeship in magic. Tiffany is a hard name for a witch to live down. But, in ancient tongue it also means Land Under Wave, something hard to live up to. But, Tiffany is up for it. The Hiver, at once terrifying and curious, is a creature with no body, no real mind, but just a sort of parasite that holds the echoes of the memories it has taken over since before time began. The hiver seeks power more for its sustenance, for its existence at some level, than for some grand end. So, the hiver naturally finds Tiffany, a powerful young witch who does not know quite how powerful she is and why. With Granny Weatherwax's and the Nac Mac Feegles' support, it would seem like Tiffany is well-armed, but, she must face the hiver alone, in her mind. And it will take all of her resource and courage to deal with it, perhaps more. What struck me about this book is the pre-teen Tiffany's bundle of emotions portrayed expertly by the author, once again establishing his mastery over not just the nuances of the language but of the human emotions and social entanglements. Arriving at Miss. Level's cottage, naive yet determined, Tiffany was most certainly not ready for the double Miss Levels - two bodies with one mind, but not in the traditional "twins" way. But she takes it in her stride and manages quite well despite the invisible neat-freak Oswald tidying up after her even before she is done messing up her room. She has no friends yet; she is far away from Chalk, her home; she does not know what the apprenticeship involves; she hopes it will be all about learning to be a witch but is slowly finding out that it might not be all about the conventional abracadabra magic but of the more subtle sort; she is quick to form opinions but quick to change them when reason demands it; and she is certainly sure of herself, at least until the hiver takes over her. Will she turn "evil" and start to cackle? Because we all know that a witch is only one step away from cackling if nobody is keeping an eye on her and she forgets the difference between right and wrong and no longer feels the need to be accountable for her decisions. All's well that ends well, as always in Pratchett's wonderful Discworld tales. Tiffany manages to send the hiver away to a place it cannot return from. She earns the respect of fellow young witches and the greatest witch of all, Granny Weatherwax, who is one of the most intriguing and complex characters in the Discworld. Tiffany learns a lot about herself, about witching, and about making her own hat. Granny Aching wore the wind for her coat and Tiffany will wear the sky for her hat. She may not be able to fly the broom without getting sick or make a shamble in a hurry (unless she really needs to), but, she can certainly open the door and show the departed the way into the next world, just like that. Pratchett's genius always leaves me awed and inspired. His keen observation and accessible presentation, not to mention his flair of language and the side-splitting-ly funny narration makes his books a much-savored experience every time I read one.